With much of the Northern Hemisphere sweating it out in the summer heat, snow is dumping in New Zealand – just in time for the ninth annual Burton New Zealand Open (BNZO) presented by MINI. Known as the Southern Hemisphere’s premier snowboarding event, the BNZO will go down from August 9-13 at the Cardrona Alpine Resort in Wanaka where top riders will compete in both Halfpipe and Slopestyle. As the kick-off to the Burton Global Open Series and a 5star event on the TTR World Tour, the BNZO will get underway on Tuesday, August 9th with official training in the morning that leads right into Men’s and Women’s Slopestyle Pre-qualifiers and Qualifiers. The next day on Wednesday, August 10th, things will heat up in the Halfpipe as Men’s and Women’s Qualifiers take place. The 10 men and 5 women who come out ahead will move forward into the Semi-finals. On Thursday, August 11th, Slopestyle will once again take center stage with an intense day of Semi-finals where the top 8 women and 16 men will advance to the Finals on Friday August 12th. Be on the lookout for key riders like Mark McMorris and Jamie Anderson to take the Slopestyle competition to new levels. Next up are the Men’s & Women’s Halfpipe Semi-Finals and Finals where Burton Team riders like Hannah Teter and Danny Davis will be competing for the top spots. Happening the last two days of the event, the Women’s Halfpipe Semi-Finals are set for Friday, August 12th followed by the Finals on Saturday, August 13th. The men will battle it out all in one day with Men’s Halfpipe Semi-Finals and Finals both taking place on Saturday, August 13th. 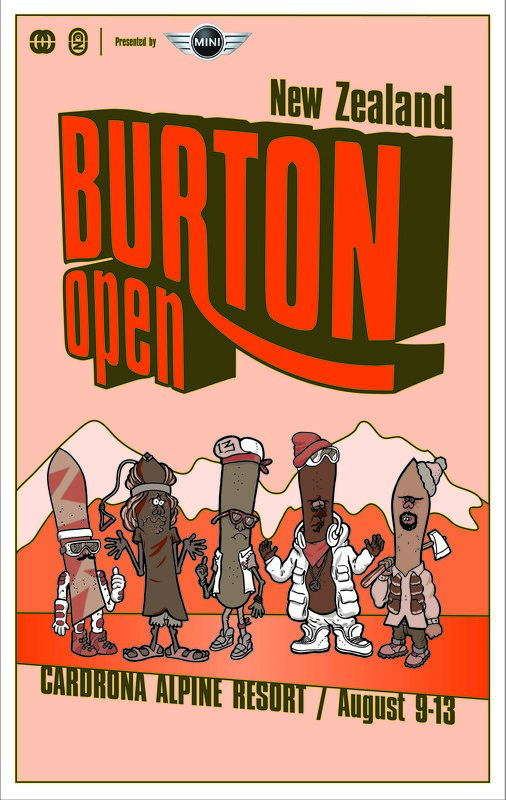 THE BURTON OPEN APRES BOARD ROOM: Starting Tuesday, the post-competition activities begin as Burton and Lone Star Wanaka present, “The Burton Open Après Board Room”, where attendees can sit back and enjoy some après time from 5pm until 10pm every evening through Friday. Taking place in the upstairs room at the Lone Star Wanaka, the Après Board Room will be the evening hub for all things BNZO including Burton movies, rider signings, SLS presentations and good, local hospitality. THE BURTON OPEN ‘AFTER APRES’ PARTY: The nights never end as Opium Wanaka will be hosting, “The Burton Open After Après Party”, taking place Tuesday, Wednesday and Friday, from 10pm onwards. Full DJ line-up to be announced soon. Full BNZO details and updates are available via www.opensnowboarding.com. The live webcast will be available on www.opensnowboarding.com and Redbull.tv from August 12th-13th.